Russia’s most successful sailing team, Synergy continues to go from strength to strength. Captain Valentin Zavadnikov talks about the team’s origins and how yachting is developing in Russia, and explains why a professional sailing team cannot be solely Russian. The Synergy sailing team is the best known Russian project in the sport. Originally, the team was 100 percent Russian-speaking, however gradually it has evolved into an international one. Synergy captain, politician and businessman Valentin Zavadnikov explains why a professional sailing team cannot be solely Russian and how yachting is developing in Russia. Synergy successfully competes in international regattas in three classes: RC44, Melges32, and Melges20. All of them have one thing in common: an amateur owner/helmsman. Synergy started off exactly 10 years ago, as a private project launched by six Russian businessmen. Their objective was to set up a Russian-speaking sailing team capable of competing with world-class professional crews. As captain Valentin Zavadnikov recalls, initially there was no intention to set up a team to represent Russia at international events. "It was not a national project, but just a matter of personal curiosity. We used to do yachting when we were young but gave it up after the break-up of the Soviet Union. A sport turned into a hobby. While on holiday, we would rent a sailing boat, just for fun. Then at one point we decided to combine a holiday with taking part in a race," he explains. There is a whole range of racing yacht classes in which helmsmen can be not only professional sportsmen but the owners too. That was the direction the Russian team decided to follow. "However, it very soon became clear that combining a holiday with showing a good result in a race was impossible," Valentin says. By the end of 2004, the Russian yachtsmen, on a rented yacht, came in second in the famous Mediterranean regatta, the Rolex Middle Sea Race. The next year, they had a 40-foot racing cruiser built for them in Italy – a vessel on which, in the six months of the 2005 season, Synergy took part in 11 international regattas, winning three and finishing seven more races in the top three. During that time it became clear how to form a team. "We realized that if we want to have a holiday, we should have a holiday, while if we want to race, we should be serious about preparations, training, and sorting out the team. As they say, one cannot be slightly pregnant," says Zavadnikov. When they began considering a full-time racing team, it became clear that it was practically impossible to form a team comprised of Russians alone. "We had to replace several teams. First, we had just Russians, Belarusians and Ukrainians. Then we also had Italians, New Zealanders and Americans,” says Zavadnikov. “Then at some point we gave up the idea of trying to form a purely Russian team because the skill set of people who were trained in yachting in Russia does not make it possible to form a team capable of competing at an international level. There is also another serious problem, that of Russians' mentality. The thing is that people who grew up in the USSR are not used to competing," the captain explains. Zavadnikov recalls that when the team was comprised of Russians, Ukrainians and Belarusians, they simply separated into three camps and began to fight with each other, which prevented the team from competing well with others. "On a boat, everyone has their own area of decision-making and crew members operate within those. If there is a failure, they admit their mistakes. Sportsmen from the former Soviet Union are used to having a boss who tells each of them what to do. Whereas on a boat, things happen so fast that there can be no single boss, his functions are divided between several people. For example, the decision of which sail to hoist at any particular moment is taken by the person who is in charge of sails, not by the helmsman or the tactician," he says. Having sorted out the make-up of the team, Synergy focused on the America's Cup. In mid-2006, for the first time it took part in a class TP52 race, whose format is very close to that of the legendary regatta. In the several years that it has taken part, Synergy has scored some very good results, including third place at the TP52 World Championship in Valencia. Synergy also became a preferential shareholder in the World Sailing Teams Association (WSTA), which has set up the Louis Vuitton Trophy super series. In October 2010, the team made its first appearance in an RC44 class race. In 2011, it racked up 15 match race victories and finished five fleet races in the top three. In the 2012-13 RC44 match race, Synergy won 44 of the 57 races. In 2013, the team won its first gold in a RC44 event, the RC44 Cascais Cup. In addition, the 2013 season became the team's first in the Melges 32 class. Synergy has been recognized as the best sailing team of the year by the All-Russia Sailing Federation twice in a row – and Valentin Zavadnikov was voted the yachtsman of the year in 2013 by the world's main yachting club, Yacht Club de Monaco. 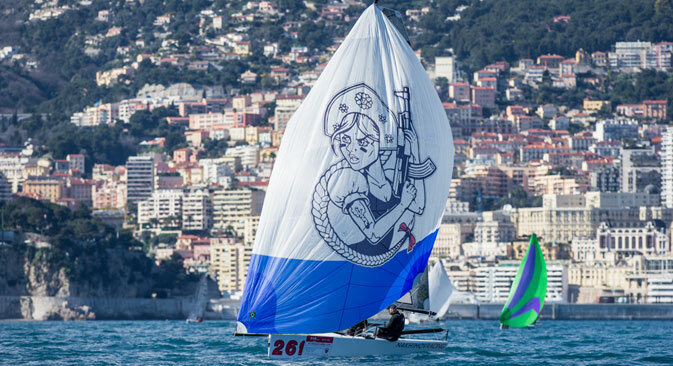 Zavadnikov is convinced that Russia has the potential for developing sailing as a sport but this would depend on specific individuals interested in making it happen. "Russia has points of growth. There are marinas and yacht clubs, which are developing this sport. People are beginning to have spare money; they buy yachts, open cafes and restaurants, set up sailing schools for children, and things move on from there," the Synergy captain concludes.